The District of West Vancouver has joined with its North Shore neighbours in the adoption of British Columbia’s new Energy Step Code. On Monday (Feb. 5), West Vancouver’s government approved implementation of the step code, aligning itself with the City of North Vancouver and the District of North Vancouver. 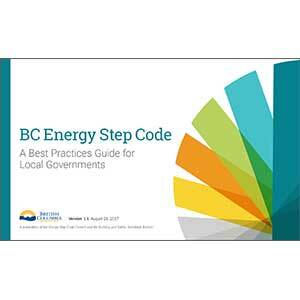 The BC Energy Step Code is a voluntary provincial standard launched last April that uses tiered criteria to improve on base-level building codes to construct more energy-efficient buildings around the province. The B.C. government says the step code is central to its goal of constructing net-zero energy-ready buildings by 2032, meaning buildings that consume the same amount of energy that could be produced on-site. The code establishes a series of measurable, performance-based energy-efficiency requirements for construction of residential and commercial buildings municipal governments can choose to adopt via their own policies and bylaws using various incentives such as density bonuses. It requires builders to use energy modelling software and on-site testing to show their designs and construction meet the requirements. Builders and designers can use new technologies as they emerge and the code would be compatible with natural gas, electricity and other energy sources. The provincial government published an online guide for the code in September. West Vancouver is in the final stages of amending their building bylaw to bring it in line with the step code, said Courtney Miller, the district’s senior sustainability planner. “It’s going to be considered for adoption next Monday,” he told RENX. Miller said many builders in the district are already constructing homes and buildings exceeding the base building codes. The step code covers Part 9 buildings (houses and small buildings of three storeys or less) and Part 3 buildings (concrete or timber multi-family and commercial structures of four storeys or higher). It includes five steps for houses; four steps for wood-frame or concrete residential buildings; and three steps for commercial buildings. Higher steps require higher levels of energy efficiency. Municipalities can climb the steps over time, and steadily improve the quality and performance of their new buildings until they reach the highest level. On Feb. 2, three Vancouver-area builders – Nathan Stone the managing partner of the Odessa Group, Sam Zirnhelt the co-owner of Zirnhelt Timber Frames and Damon Gray the general manager of NZ Builders – expressed their support for the BC Energy Code and the municipalities who have implemented it in an opinion story for the Vancouver Sun. The District of North Vancouver had already adopted the Energy Step Code, effective July 1, 2018. That means all Part 3 commercial buildings in the district will be required to meet Step 1 criteria; all Part 3 residential buildings are required to meet Step 2; all Part 3 residential projects that require rezoning will be required to meet Step 3; and all Part 9 residential buildings are required to meet Step 3. The City of North Vancouver was the first municipality to go to public hearing in the province to adopt the step code, said Emilie Adin, the city’s director of community services. On July 1 of this year, the city will shift up its requirements for all Part 9 buildings (houses) from Step 2 requirements to Step 3, she said. For Part 3 commercial buildings, the code will remain at Step 1, while all residential Part 3 buildings will climb from Step 1 to Step 2, Adin said. “The whole purpose of this is to stretch the building community to achieve excellence but without incurring unreasonable costs,” she said. Adin said their experience with the transition could be helpful to other municipalities. Consultation with industry should be happening early and often, Adin said. “And not just with developers, but with the builders and the designers,” she said, stressing not all architects and engineers are well-versed in the latest green technologies and policies. “It’s about getting everyone on board,” she said. “Having clear and transparent processes and forms developed (is helpful) so that people see a clear path to meeting municipal requirements,” she said. So far, 16 municipal governments in B.C., including Victoria, have notified the province they are undergoing consultations with the building and development communities about transitioning to the step code. Miller said they have been working closely with their North Shore counterparts and once the step codes have been fully implemented, it will mark the first time in more than a decade all three municipalities will have energy efficiency requirements aligned.